Home » Articles » Outdoor Life » Wildlife » Birds » Our Swifts are in decline. Can you help? 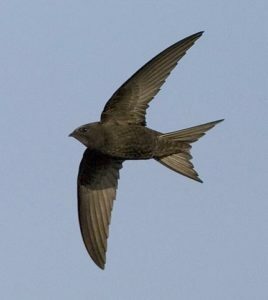 The all black plumaged Swift, not to be confused with the Swallow or House Martin, is in decline at the national level. It is a long distant migrant aerial feeder that has evolved a remarkable lifestyle. It sleeps on the wing, can live for potentially 20 years of age, forms faithful pairs, uses precisely the same nesting niche every year, and winters over the insect rich skies of the African Congo. Its young have the ability to go torpid, that is to enter a state of semi-hibernation, as it awaits its parents who may be out foraging for food for up to three days. The egg is incubated for c.20 days and then the nestling(s) are brooded for a further 42 days. When a young Swift fledges it is completely independent of its parents and has no need to return to the nest. Swifts are usually with us in the UK for about 100 days a year from early May to the middle of August. It is now becoming clear that the Swift is not now replacing itself. Since 1995 the UK population has declined by c.50% (RSPB data). Reasons are probably several fold but the two known factors are a diminishing stock of places to nest. Swifts nest under the eaves of buildings where access was provided in the older style buildings. Now that soffit and fascia boards are being added to improve a building’s insulation properties, their traditional nesting niches are being blocked; and modern buildings tend to be constructed hermetically sealed. Secondly, the practice of today’s monoculture farming works towards reducing insect life, thus reducing the abundance of aerial insects. Swift nesting requirements are very particular! 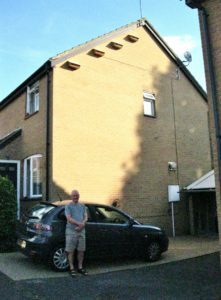 The gable ends of residential houses with a clear flight line and no telephone or power cables in front are a good example. But not every house is suitable. Boxes should be 3.5 metres minimum above the ground (but higher is preferable) as Swifts drop out of their nest site and swoop down to gain speed. They prefer boxes that are tucked under and close to the eaves. A south facing elevation should be avoided as the contents may cook in the sun’s heat! Article provided by John Smart of S.o.S = Save our Swifts! The Swift Representative for Essex. Member of the voluntary sector. In partnership with the Essex Wildlife Trust and the Essex Birdwatching Society. The EWT has included the Swift within the Living Landscape remit.